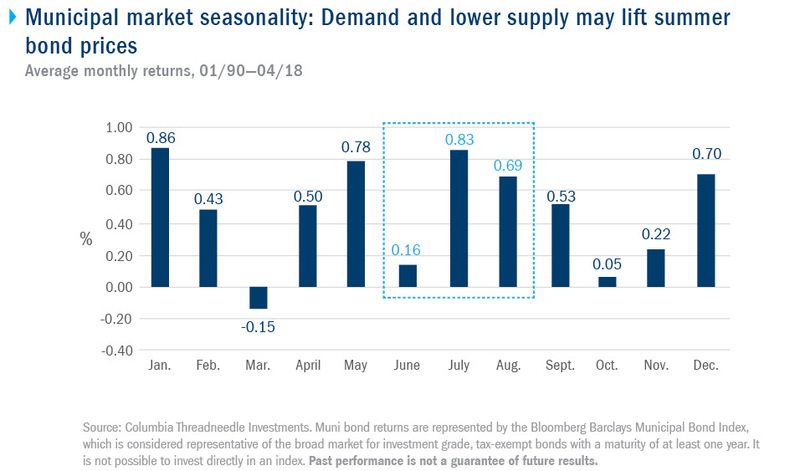 As we kick off the historically positive summer months for the muni market, investors could see higher returns — but may have a hard time finding bonds. The passage of Memorial Day has officially ushered in summer: the season of backyard barbecues, pool parties and municipal bond redemptions. The three months beginning in June are often characterized as a heavy reinvestment period — the municipal market finds itself awash with cash as bonds mature, pay coupons or get called (meaning, the bond is redeemed by the issuer prior to its maturity). This year seems to be no exception, and a dearth of new bond issuance could drive negative net supply lower than what we saw in recent years. While this technical backdrop should support municipal bond prices, it could also introduce new challenges for investors trying to put money to work. After its worst start in over two decades, the municipal bond market could be poised for a turnaround. The historically favorable summer months are upon us, along with the expectation for higher volumes of coupons and principal payments that investors will want to reinvest. Such heavy seasonal redemptions are certainly not a new trend, and they provide the market with a strong and reliable source of demand. However, that money may be chasing a shrinking pool of bonds if recent supply trends persist. Municipal bond issuance dropped 23% year-over-year and was at a four-year low through April 30. Market observers expect supply to remain light through the summer as Wall Street bankers head out on vacation and few issuers bring new financings to market. JPMorgan suggests that the combination of robust reinvestment capital and anemic new issuance could result in a negative net supply of -$76 billion between June and August: a change of 44% over last year and 91% over the trailing five-year average. Such favorable technical conditions — more money potentially coming into the market than new bonds being sold — should also set the stage for stronger investment returns. The Bloomberg Barclays Municipal Bond Index returned a disappointing -0.33%1 this year, but prices have historically bounced back as June’s cash flows get reinvested amid scarce supply in July and August. If negative net supply estimates materialize and exceed that of past years, returns could be even better. But the supply shortage could also make sourcing bonds far more difficult. Lack of issuance in the primary market should drive buyers to the secondary market where dealer inventories have shrunk considerably since before the financial crisis. As a result, individual bond buyers will likely find themselves paying more for a dwindling pool of available bonds. We believe the recent underperformance of the municipal market offers an attractive entry point for investors ahead of what could be a strong performance period, and more dollars chasing fewer bonds should drive prices up and support total returns. However, this same dynamic will likely cause frustration among individual bond buyers who struggle to put their investment dollars to work. Professional management can provide broader access to investment opportunities with more efficient execution. 1 Through May 31, 2018. Municipal securities will be affected by tax, legislative, regulatory, demographic or political changes, as well as changes impacting a state’s financial, economic or other conditions. A relatively small number of tax-exempt issuers may necessitate investing more heavily in a single issuer and, therefore, be more exposed to the risk of loss than investing more broadly. Income from tax-exempt municipal bonds or municipal bond funds may be subject to state and local taxes, and a portion of income may be subject to the federal and/or state alternative minimum tax for certain investors. Federal income tax rules will apply to any capital gains.  Is rising consumer debt cause for concern?